Thailand is the ideal destination to head to if you like the idea of an exciting experience holiday, but secretly quite fancy a luxurious hotel too. Joanna Cooke, spokesperson for the Tourism Authority of Thailand (TAT), said you can still get off the beaten track during daytime excursions, but have the added attraction of going back to one of the country's many top-notch hotels to sleep and eat. "The Thai hospitality and the service that you get there automatically adds an extra star to where you are staying," she enthused. Joanna recommended checking out some of its many temples while on a holiday there, as they are a great way to learn about its diverse cultures. 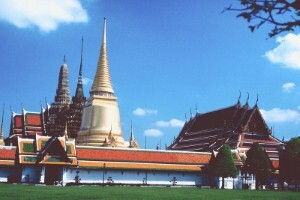 According to TAT figures published last week, more than 630,000 people from the UK went to Thailand between January and November 2009. If this has left you keen to try Thailand with your family this year, you could cut the cost of your travel insurance by taking out a family travel insurance policy with us. It'll cover all of you for delays, cancellations, luggage loss legal expenses and much more so you'll be free to enjoy your holiday worry-free! Published by World First Travel Insurance - providers of worldwide travel insurance for all types of holiday, travel insurance for pre existing medical conditions and great family travel insurance. Get in touch for competitive travel insurance quotes today. Want more like this? Subscribe to the RSS news feed or check out the World First Blog.